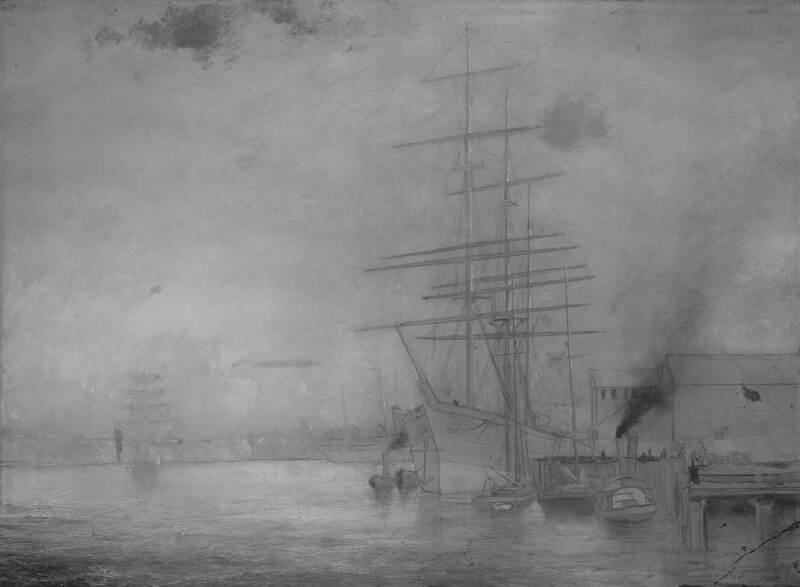 The painting records the commercial activity at the Eagle Street Wharves, now part of Brisbane’s Central Business District. 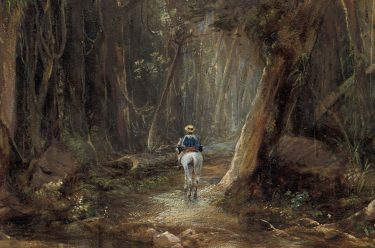 Towards the background, Wishart has captured the Bunya pines in the old botanic reserve (later to become the City Botanic Gardens) established in 1828 to provide food for the early penal colony. 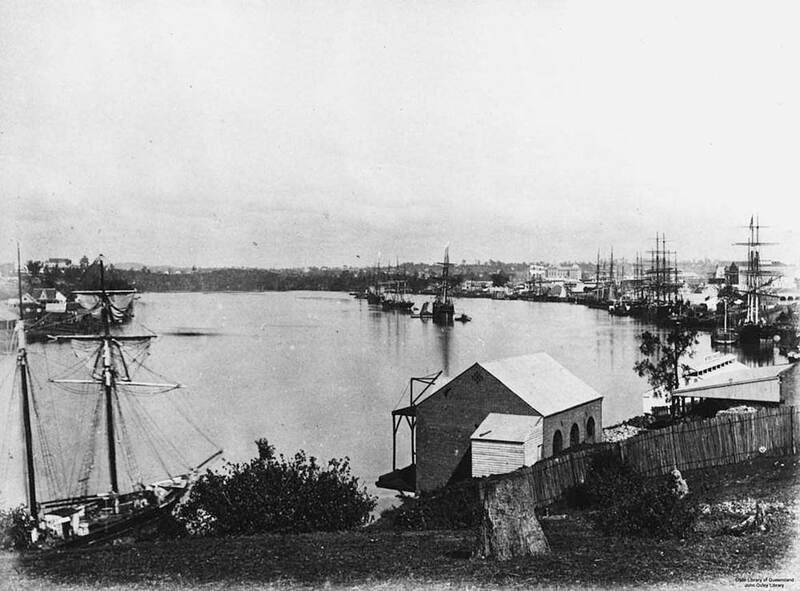 Further back, the light strikes the cliffs at Kangaroo Point. A photograph of the ‘A.W.S.N. 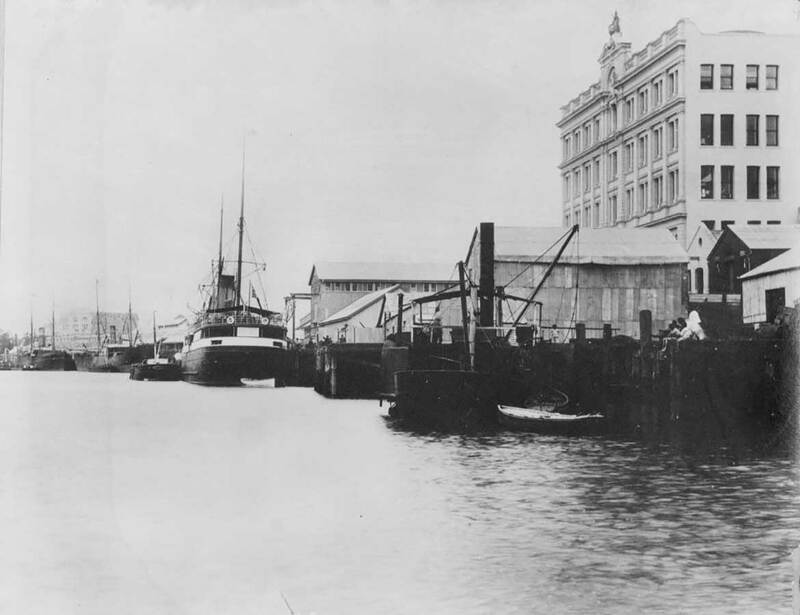 Wharf and Thomas Browns Building’ 1989 shows the two galvanised iron covered warehouses that Wishart depicts. The line of windows set just below the roof-line in the distant building is particularly distinctive. 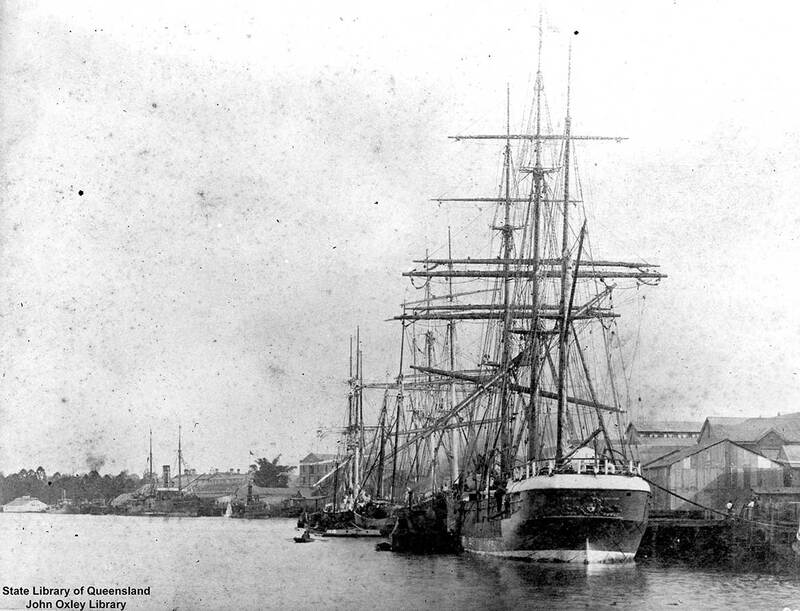 Similarly, the photograph ‘Eagle Street Wharves’ 1888 is close to the character of the painting, other than the masted ship faces the opposite direction, the suggestion that Wishart based his works on photographs is reinforced. Go behind-the-scenes with Anne Carter, QAGOMA Conservator and watch as she delves into the secrets of A busy corner of the Brisbane River. The painting has undergone major conservation, and as a late 19th century painting, it has special conservation needs. These are mostly due to the difficulty of removing stubborn wax and varnish layers from thinly painted, sometimes solvent sensitive paint, in areas such as the rigging. The varnish had become yellowed and some of the in-painting which had been completed to reinstate or restore damaged areas had discoloured. 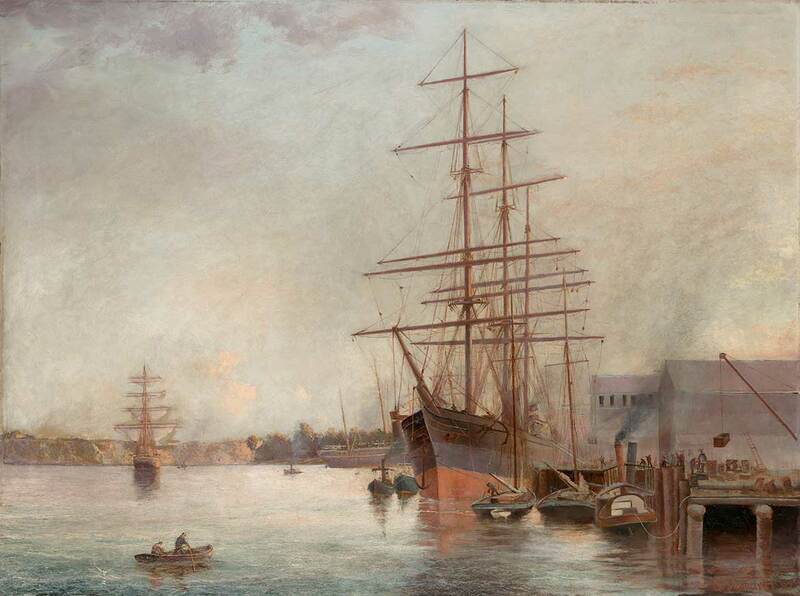 Infrared images of the painting indicate that Wichart prepared a very careful under-drawing, we can see exquisite outlining of the large ships and their rigging, as well as free sketching of figures and cargo, and the horizon of the Kangaroo Point cliffs. Also revealed are many small changes, for example, examination shows that the small boat in the foreground of the completed painting was an afterthought, as seen in the X-ray, the river continues through the boat design, and there is no sketch of it in the original composition. 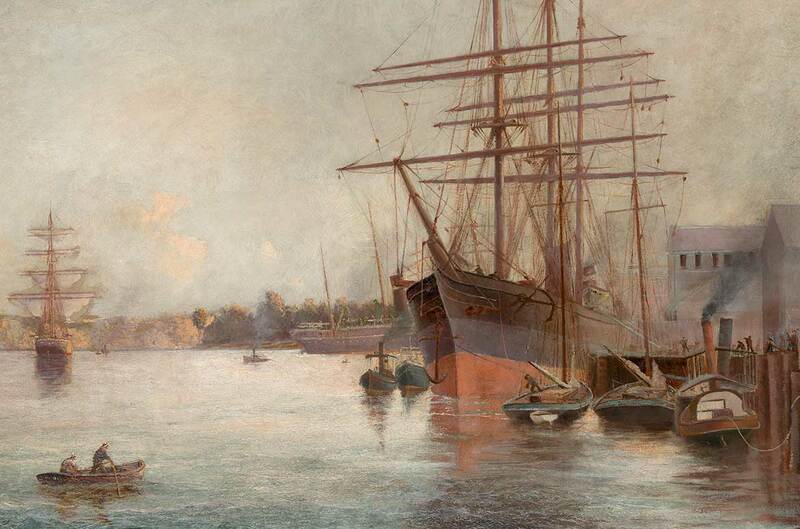 A busy corner of the Brisbane River is of considerable interest and importance as paintings which represent the commercial activity on the Brisbane River are extremely rare. 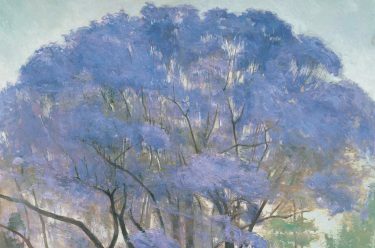 You can now view the restored painting in the Australian Art Collection at the Queensland Art Gallery. 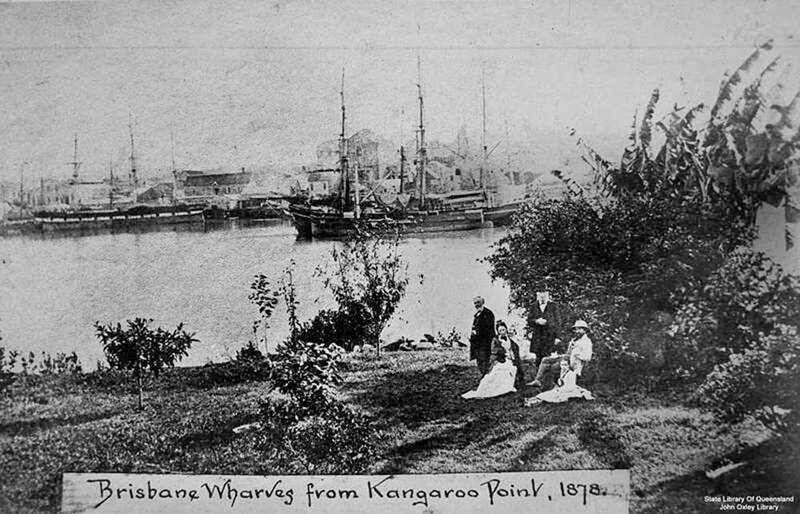 1 The Queenslander, 15 May 1897, p.15.